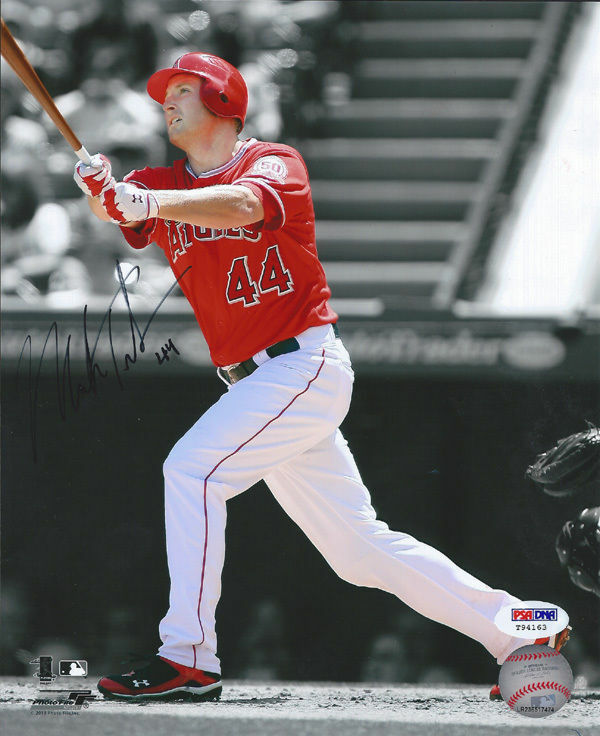 Mark Trumbo was picked by the Angels in the 18th round of the 2004 MLB Draft (533rd overall). After spending several years in the minors, he made his MLB debut on September 11, 2010. During his first full season with Los Angeles in 2011, Trumbo hit 29 home runs and notched 87 RBIs. However, his batting average was just .254. Trumbo finished second in American League Rookie of the Year voting. Although Mark Trumbo cards did well during his rookie campaign, collectors started to really take notice the following year. 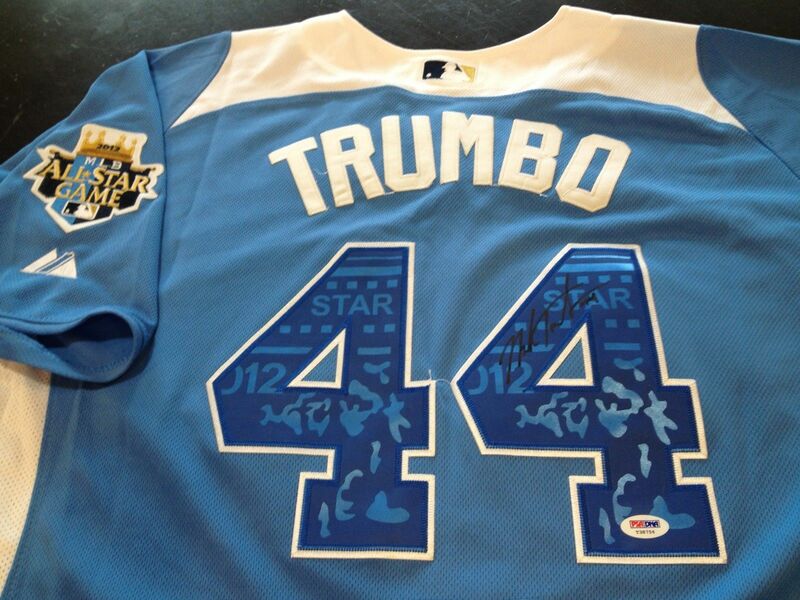 In 2012, Trumbo continued to flex his power, knocking 22 homers before the All-Star Game. Alongside emerging superstar Mike Trout and the newly acquired Albert Pujols, Trumbo was supposed to be part of something big in Anaheim. After the Angels struggled in 2013, Trumbo was traded to the Arizona Diamondbacks. As far as the status of Mark Trumbo cards go, this trade will likely hurt his overall appeal. The Diamondbacks don't have the same notoriety as the Angels so he likely won't get as much attention. That said, a fresh start playing alongside Paul Goldschmidt could make for a potent combination. Click here for an in depth look at Mark Trumbo's rookie cards. 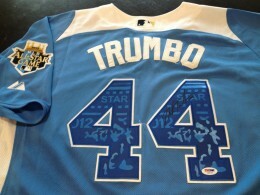 Mark Trumbo #15 Arizona Diamondbacks T-Shirt - BRAND NEW, NEVER WORN! 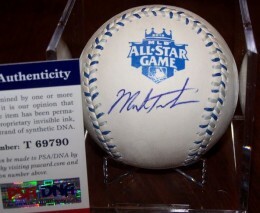 Below you will find an example of what Mark Trumbo's authentic signature looks like. This can be used as a first point of reference for determining the legitimacy of autograph memorabilia, but is not a substitute for having your items authenticated by a well-respected professional autograph authentication company. Some of the trusted sources within the sports memorabilia market include the following companies: PSA, JSA, and Mounted Memories. The signature exhibits an overall consistency and is fairly legible. The letter "M" leans to the right and includes a small curl on the top left, the second hump is more narrow than the first. The letter"a" is tiny and combines with an implied "r."
The letter "k" includes an open loop on the vertical line. The letter "T" is printed and crossed at the top. The letters "r-u-m" all run together. The letter "b" looks more like an "l."
The letter "o" is discernible.